When Vesuvius erupted in 79 AD, it destroyed the flourishing Roman city of Pompeii and other surrounding towns, killing thousands. Death came in a number of different ways, from fatal fractures induced by shaken ruble and toppled buildings to asphyxiation from the noxious gases released by the volcano. And according to a new paper, some victims met the fury of Vesuvius first hand, becoming engulfed by flows of hot ash and lava fragments. The heat was so intense that the thermal shock was enough to crack open the victims’ skulls and boil their brains, Italian researchers claim. A few days before the volcano erupted in all its might, Vesuvius caused a series of earthquakes that toppled structures, claiming the first victims. Recognizing the signs of impending doom, many inhabitants from Pompeii and the smaller settlements Herculaneum, Stabiae, and Oplontis, wisely fled the incoming onslaught. Not all of them, however — by some estimates, 2,000 people died by the time Vesuvius spewed its last plumes. The victims stayed buried beneath pumice and ash, all but forgotten for nearly 1,500 years. That all changed in 1738 when archaeologists rediscovered Pompeii, recognizing that the soft ashes on the site were actually cavities left from the dead. Today, the images of Pompeii’s contrived bodies of men, women, and children are famous around the world. But there’s still much we don’t know about their final days, despite many years of research. The skeletons of a child (left) and adult male (right) from Herculaneum, whose frozen postures suggest they died instantly. Credit: PLOS One. In a new study, Italian archaeologists paint a richer picture of the horrors beckoned by Vesuvius. The researchers at the Federico II University Hospital in Naples analyzed the remains of victims from Herculaneum, which, like Pompeii, was covered in ash and soot. Herculaneum, however, rests near the foot of Vesuvius, much closer to the epicenter of destruction. Seeking to flee away from danger, around 140 people sought shelter in houseboats at the town’s beach. However, none survived and the victims were covered in an avalanche of ache, which preserved their skeletons still in their final death pose. Following the archaeological’s site discovery in the 1980s, scientists concluded that the victims died by asphyxiation after ash smothered their shelters. 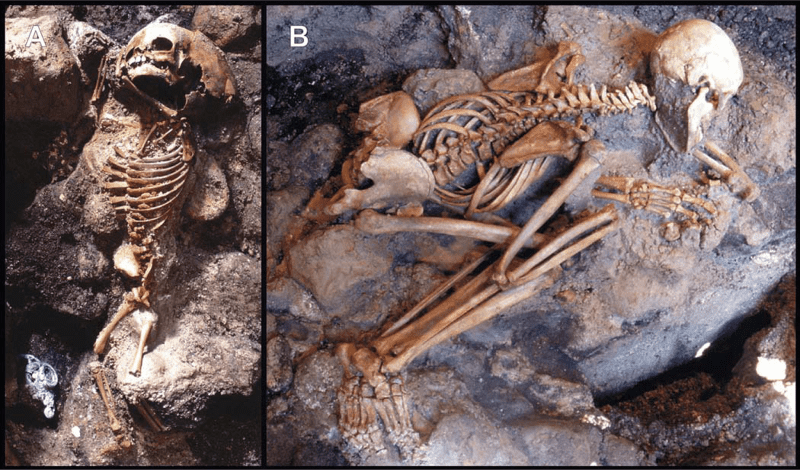 But the new analysis suggests that the ancient Herculaneum locals were actually killed by heat. The team argues that the victims were overrun by pyroclastic flows of hot ash and lava fragments that could be as hot as 300°C (572°F). Red and black residues found on the skulls and other bones contain unusual amounts of iron, a chemical analysis revealed — this may be superboiled blood and other bodily fluids. Also, many of the bones recovered from the site are fractured, which would be expected in a thermal shock event. 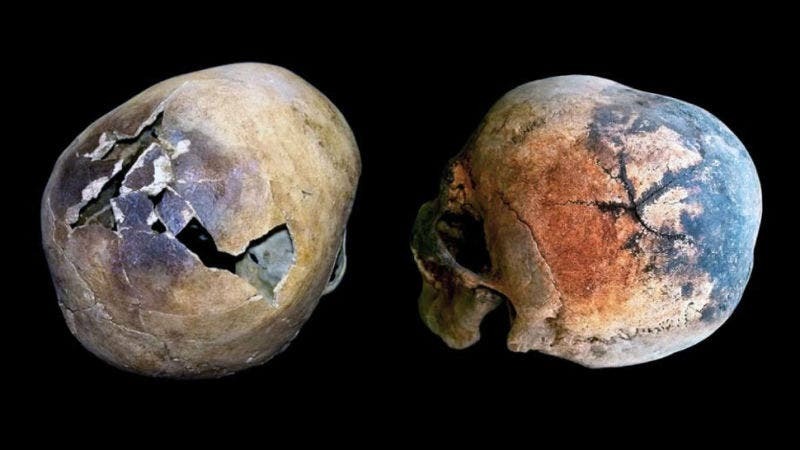 This may explain why skullcaps belonging to many skeletons showed evidence of “cracking and explosion”. The circular patterns on the skulls also suggest that brain matter was expelled. “The extraordinarily rare preservation of significant putative evidence of hemoprotein thermal degradation from the eruption victims strongly suggests the rapid vaporization of body fluids and soft tissues of people at death due to exposure to extreme heat,” the authors wrote in the study’s abstract. Strikingly, the findings suggest that over a hundred people met their end horribly, practically getting boiled alive. But perhaps their finals days were less horrible since death came in an instant, which we can’t say about Vesuvius’ asphyxiated victims. “These findings highlight the need for thorough evaluation of key bioanthropological and taphonomic evidence during archaeological investigations. This is particularly true for the sites affected by the 79 AD Vesuvius eruption, given the high-risk scenario for three million people living today close to the volcano, even if sheltered within buildings,” the team of Italian archaeologists concluded.